An Exciting Evening: Interact and Rotaract. 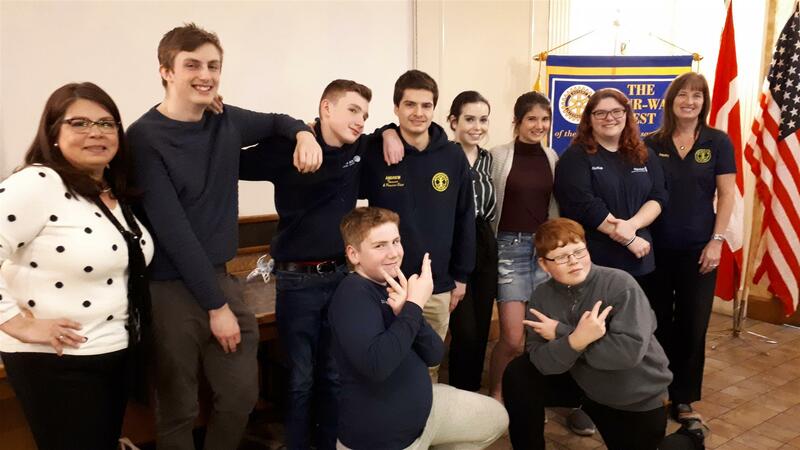 The Wayside Dining Lounge was buzzing with excitement for the annual event attended by the St. Thomas Interact Club, representatives of the London Interact Club and the Rotaract Club at Western University, Rotarians from the St. Thomas Club and the Railway City Rotary Club. President Trish welcomed District Governor Jim Schlatman, Past DG Diane Chantler and Assistant Governor Nancy Lovelock. Bob Warnock represented the newly formed District 6330 Passport Satellite Club. 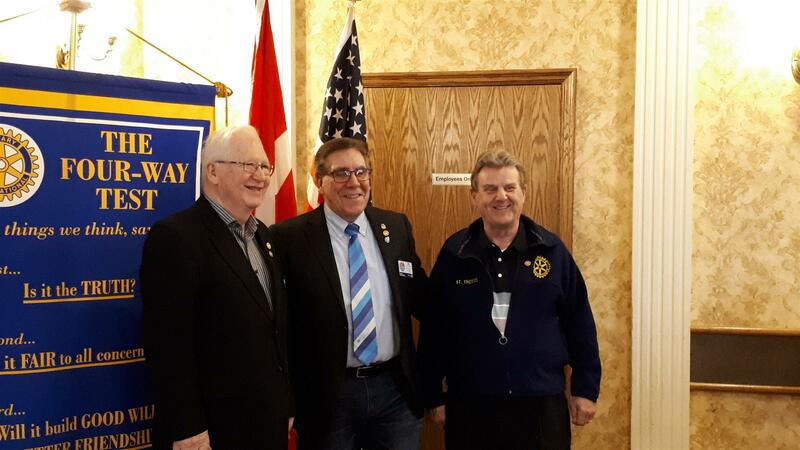 DG Jim Schlatman presented Paul Harris Fellows, Ron Somerville and Malcolm Rust with their new badges in recognition of their donations to The Rotary Foundation. The London Interact Club was represented by Michelle Couture Foote. The Western representative was Liam Martyn. Total attendance was 39. St. Thomas Interactors have been engaged in sending students to the Seminar for Tomorrows Leaders at U. of Western; a student to Ottawa for the Citizenship week; delivering a selection of bears to the emergency shelter for women and children; learning about bees from a local beekeeper; selling tickets for the Pony Poopin' Bingo ($24.5K to the Children’s Hospital in recent years); having fun events; planting trees; offering car washes; window painting at Christmas; paying for parking at the hospital; collecting canned food at Halloween; making small business loans in the Kiva program and always wearing their t-shirts with their ”Be the Change” slogan. Liam reported that one of the big projects for Rotaractors has been a residential weekend for 30 families living with Juvenile diabetes. Club membership has been about 100 this year. Another major event was the Global Health Symposium in March. This annual event at the University engages students from various faculties to explore global health from a biomedical, social and environmental perspective. This conference features keynote speakers and interactive workshops. Interactors from the London club have been busy volunteering with the Salvation Army; collecting and distributing warm clothing; serving hot chocolate on cold days; doing random acts of kindness and many other activities. Over the 2018 Canada Day week, Rotary Club Of London South supervised the painting of the Rotholme mural wall. Two years ago the club cleaned up and painted the blue background on the wall near the playground at Rotholme. And after the youth of Interact spent 10 hours creating the mural and another 10 hours painting it collectively Rotholme Women's & Family Shelter now has a beautiful and fun mural for the kids to enjoy while they play! $5 donations to the Rotary International World Fund, credited to the individual donor. 2-Maggie Horn. Winning 50/50. Grandson’s 20th birthday. 2-Trudy Kanellis. Very proud of her team of Interactors; pleased to have Adriana’s support as co-leader. 1-Sue Bandeen (sbandeen1@gmail.com) Railway City Rotary Club. 2 Outbound RYE students. 1 Inbound RYE student: Anna coming from Italy. 2-Sandra Westaway. (budsandra62@gmail.com) Grateful for the support for “Inn out of the Cold”. 1-Malcolm Rust. Congratulating Ron on his PHF; Trudy for her exceptional leadership for the Interactors. 1-Marco Valdez (Adriana Balderas). Andrew, Interact President, passed his driving test . Total: $90.00 for Rotary Projects globally. Following Trudy's inquiry and members' indication of support, President Trish contacted the Kettle Creek Conservation Authority (KCCA). We are planting trees again this year on May 2, 2019 at 4pm at Kettle Creek Conservation area, Ferguson Line. Get ready for some fresh air and exercise. President Todd Stepanuik and the members of the Strathroy Club will greet us for their noon lunch meeting on: Tuesday April 23, 2019 at Duke Restaurant, 51 Front St East, Strathroy (located in the Kenwick Mall). Lunch is a menu and the cost is $18 including beverages. Our usual Wednesday April 24 meeting is cancelled. TO ORDER YOUR LUNCH PLEASE ARRIVE 15-20 MINUTES PRIOR TO THE MEETING. THE MEETING IS CONDUCTED DURING LUNCH. CHOCOLATE EXTRAVAGANZA, Saturday April 13, Columbus Club, 265 Wellington St, 10 a.m. to 4 p.m. If you are unable to work but could attend, we would be pleased to see you. Our club is donating a power washer to the East Coast Kitchen Party auction. Barbara Warnock is also hosting another dinner with proceeds to the club. Last year her dinners sold for $700! The date is 10May2019 at the Hellenic Centre, London. Contact Barbara or Trish for your spot at a table. Meal choices this year include: Full lobster, surf and turf, chicken and vegetarian. Service and bar service has been improved. 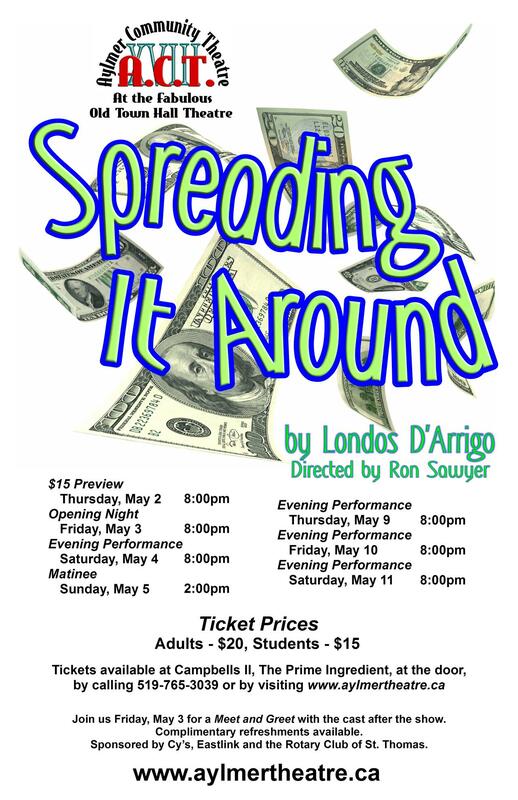 Ticket price is: $100 plus HST. It will be an amazing evening of East Coast music! The Chamber of Commerce Impact Awards night with Peter Mansbridge speaking will be held on Thursday May 9th at St. Anne's Centre. The Wayside is catering and we have 11 people attending thus far. If you know of 5 more who wish to join us, we can create another table of 8 where the ticket per person price goes down to $75 including tax. Talk to President Trish or Jennifer Babcock for details.